The Victron Battery Balancer and Battery Monitor for Off-Grid Solar equalizes the state of charge of two series connected batteries, or of several parallel strings of series connected batteries. higher initial state of charge and sulphation (caused by undercharging) of the batteries with the lower initial state of charge. 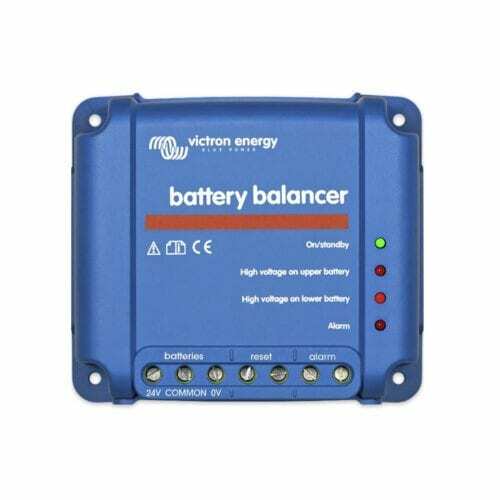 The Battery Balancer equalizes the state of charge of two series connected 12V batteries, or of several parallel strings of series connected batteries. When the charge voltage of a 24V battery system increases to more than 27,3V, the Battery Balancer will turn on and compare the voltage over the two series connected batteries. The Battery Balancer will draw a current of up to 0,7A from the battery (or parallel connected batteries) with the highest voltage. The resulting charge current differential will ensure that all batteries will converge to the same state of charge. If needed, several balancers can be paralleled. A 48V battery bank can be balanced with three Battery Balancers. Red: alarm (deviation > 0,2V). Remains on until the deviation has reduced to less than 0,14V, or until system voltage drops to less than 26,6V. Two terminals are available to connect a push button. Interconnecting the two terminals resets the relay. The reset condition will remain active until the alarm is over. Thereafter the relay will close again when a new alarm occurs.